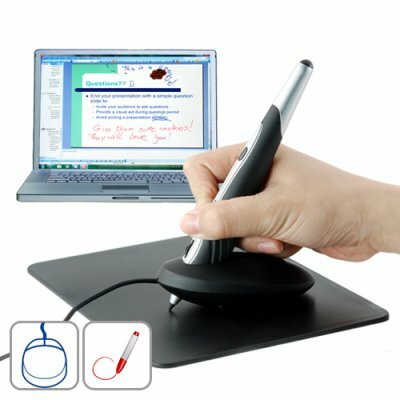 Successfully Added PC Pen - Presentation Aid + Handwriting Input + Laser Pointer to your Shopping Cart. A great wholesale priced, factory direct product, The PC Pen is a 3-in-1 productivity tool that enhances your presentations, lets you text input using your handwriting, and works as a laser pointer. Make your presentations come alive with The PC Pen! Just plug it into your notebook's USB drive and it works seamlessly with programs like Microsoft Office 2003 and 2007. Showing a Powerpoint presentation? How would you like to write comments on the screen or circle important items? The ability to add real-time meta-data makes presentations more relevant and useful. With The PC Pen, you can do all this and more! Ideal for Windows systems, it's the perfect tool for writing your signature to append to emails, writing instead of typing, you can even let your kids practice their handwriting with the tool! What about drawing? Plug-in The PC Pen, open up MS-Paint, and your kids will keep themselves entertained for hours! It's the little things that will make you fall in love with your PC Pen. Manually adjust between 200, 400, and 800 dpi for handwriting sensitivity. Use the pen as a mouse (press down on the pen nib to simulate pressing the left mouse key for example). Remove the cap from the PC Pen and you've got a fully functioning laser pointer! And because The PC Pen contains a rechargeable lithium ion battery, you'll never have to waste money on those expensive battery buttons ever again! The Factory-Direct Wholesale Priced PC Pen with presentation aid, handwriting input, and laser pointer functionality is perfect for home or office. Get one today to see how great this watch is, then feature it on your webshop or internet storefront to generate some high margin sales for yourself. We'll even dropship it straight to your customer's door! But act quickly, this is a limited time product offer!! Use the rolling key to page up and down even while you are using the laser pointer. Excellent tool for non-English character input, ie Chinese or Japanese. Exactly what can I do with this pen? You can use this pen as a mouse or you can use like a real pen where whatever you draw on any surface gets input as handwriting onscreen. You can even have transform you handwriting to text. It's also a great way for kids to practice their handwriting. Keep kids entertained by using it with popular drawing programs like MS Paint.